The positive effects of good lighting on the quality of life are vital: it enhances human health, productivity and comfort. With Human Centric Lighting the office becomes an inspiring space that is able to stimulate higher performance efficiency, supports the ability to concentrate, while it also increases the feeling of well-being. Human Centric Lighting is a stimulator that influences our mood, behavior and energy level. 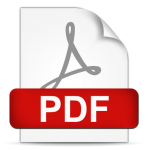 Photoreception in the human eye leads not only to vision but also has effects on human physiology, often summarized as non-visual effects of light. As a result, light has influence on the daily hormone level, initiating continuous changes as the day progresses. The Circadian Rhythm is responsible for the human biological clock, determining the sleep – wake cycle of the human body. With the latest technology we can utilise the complete light spectrum – from cold white, through neutral white on to warm white. This enables us to follow the natural rhythm of the daylight in indoor applications. The colour rendering index is excellent throughout at CRI > 90. The key to this high colour fidelity and colour rendering quality are the LED modules which combine blue, red and white light instead of red, green and blue. Light quality differences are clearly visible on the below scale. 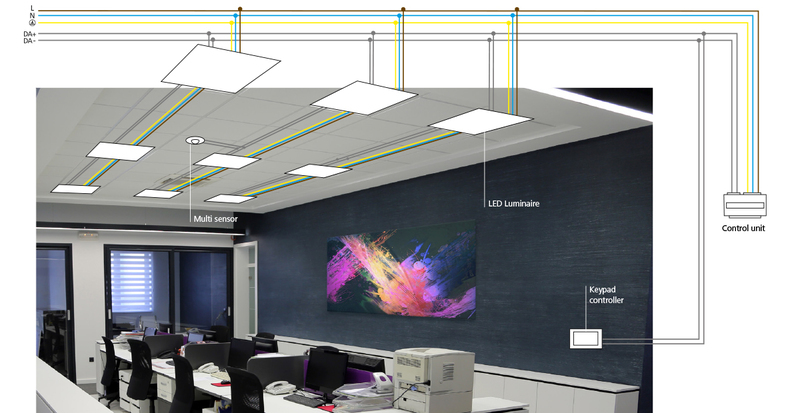 Sunlight is the reference: Sunlight spectrum, measured at a cloudy sky at 10:00 am, is compared to the Spectrum of a Fluorescent Lamp T5 – used for standard office lighting, and to the Spectrum of the new LED technology luminaire. Standard office lighting is very poor in the rendering of the green, yellow and red colours. An additional advantage of this method is its higher efficiency, especially in the warm white sector, where, for example, up to 100 lm/W can be achieved at 2,700 K.
Human centric lighting is supporting the Circadian Rhythm of the human body and improves vitality and concentration. Next to this, it has positive influence on the prevailing mood and on bodily functions, and positive effect on depression / anxiety states and on convalescence dynamic. Using it in offices where people spend the majority of their daytime has several benefits. Research results showed increase of work performance (19 %), reduction of fatigue (27 %), significant increase of the concentration (37 %), enhancement of alertness (23 %) and higher employee satisfaction. Recessed LED luminaires provide efficient lighting with pre-programmed lighting cycles as the day progresses. A fully automatic control system is implemented for ultimate user comfort. To maximise efficiency, a multi sensor is applied in the solution. It has two functions in one: daylight harvesting and presence detection. It is possible to disable the automatic cycle and choose a predefined lighting scene via a keypad controller mounted on the wall. 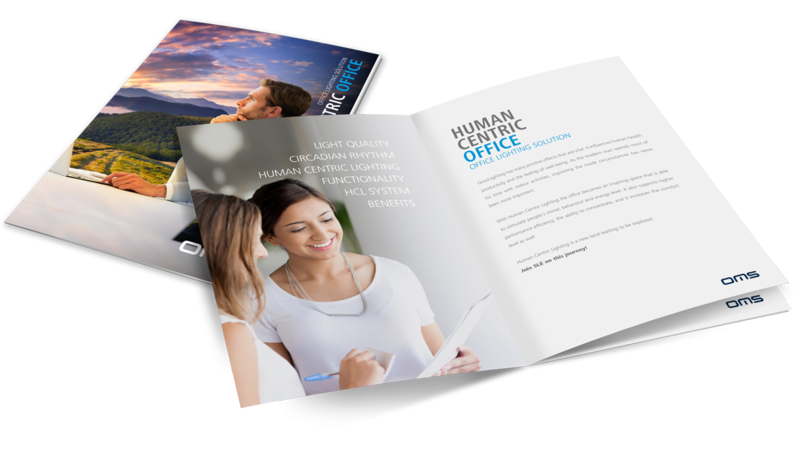 Download the Human Centric Office solution brochure to see how easy it is to turn any office into an inspiring space. Read about the importance of light quality, the Circadian Rhythm of the human body, learn how human centric lighting works and what are its benefits.